Why Chose Teamsters Local Union 987? The International Brotherhood of Teamsters is one of the largest and most powerful trade unions in North America and the world. With over 1.4 million members and a successful track record dating back over 100 years, we are part of a revolution in fighting for workers’ rights. 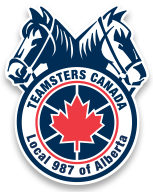 Teamsters Canada represents over 120,000 members and is recognized as a strong voice across the country impacting both industry and government decisions on behalf of Canadian workers. When you join Teamsters Union 987, you are automatically a member of a group of champions. Every one of your fellow members will be someone who has taken a stand against unfair work conditions, and you can feel confident they are on your side when you need them. Teamsters Union 987 is unique from other unions in our representation structure. Most other union negotiations are conducted by volunteer representatives (called Shop Stewards) who work for the employer. While our shop stewards are essential to the bargaining process, we also have six full-time, independent Business Agents on staff to make for an even stronger voice at the table. Our members can approach these trusted Business Agents knowing that by raising a grievance, they are not compromising relationships on the job. These expert agents’ primary duties are to defend and protect our valued members, and as such, members can be sure that their grievances will not be overshadowed by other priorities. Our Business Agents are also unique in that they have all been Teamsters Union 987 members for several years and some were even involved with organizing their workplaces. They have worked from the ground up, like you, and are very familiar with negotiating grievances and collective bargaining agreements with employers. Shop Stewards are Teamster members who educate and advocate for their peers while maintaining respectful and mutually beneficial relationships between the union and the employer. This unique position builds members into strong spokespeople and counselors, and they are supported by the Teamsters organization in their role as they defend the rights of their co-workers. Stand up. Be heard. Fight for your rights.